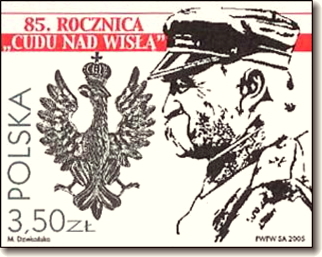 The design on the special commemorative stamp issued by Poczta Polska on 12.8.2005, the 85th anniversary of the ‘Miracle on the Vistula’. In 1920, just after the end of the First World War, on the plains of Poland near Warsaw, a decisive battle took place. 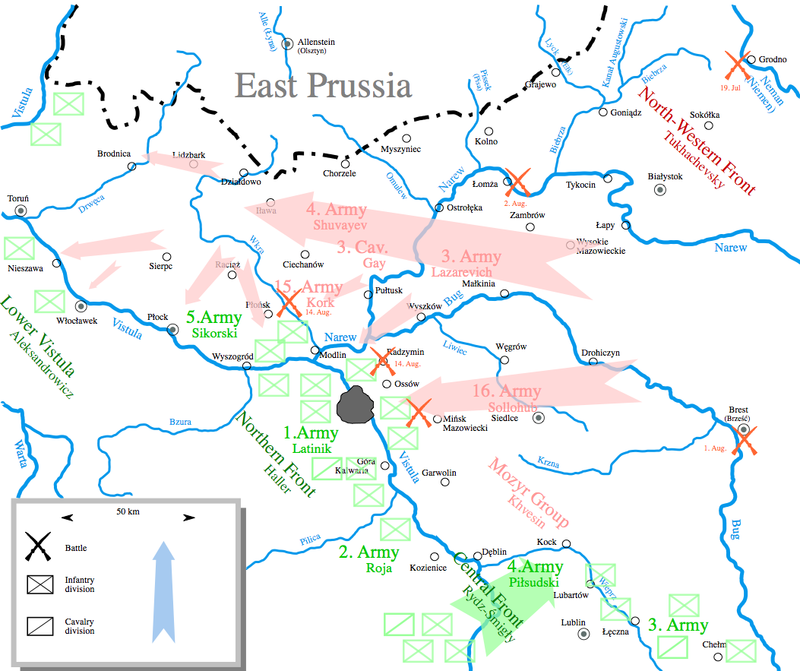 There on the Wisla and Wieprz rivers, the mighty Soviet Army, which had been cutting a swathe across Europe, was stopped against overwhelming odds by the Polish Army under the command of Jozef Pilsudski. The underdog had triumphed, against the might of Lenin’s Bolshevik Revolution. Battle of Warsaw, the first stage. Map by by Hjaekel and by Halibutt. Polish railway societies, often fighting on many fronts, would do well to take heart and learn the tactics of this remarkable battle. With dogged tenacity – and when all available forces are concentrated on the right strategic points – the underdog can triumph. Regular readers of BTWT will be familiar with the plight of the railway museum at Pyskowice. Without security of tenure, mains water, or electricity, and with the small inconvenience of a roof collapse back in 2006, TOZKiOS, under the leadership of Zbyszek and Krzysztof Jakubina, has steadily and gradually built up an impressive collection of some 70 items of rolling stock and motive power. Now matters appear to be coming to a head. The society is embroiled in a court case with PKP Nieruchomosci, the property division of PKP. When the TOZKiOS started its operations at the old Pyskowice depot in 1998, it occupied the redundant premises at a peppercorn rent by agreement with the local management of PKP. But since PKP became ‘commercialised’ (split into hundreds of separate companies) the property division has been trying to force the society to pay a ‘commercial rent’. Now the dispute has escalated and PKP is pressing for the eviction of the society from the site. An initial court hearing took place in Gliwice on 21 February. Though at various times it seemed that a breakthrough between TOZKiOS and PKP was imminent, it appears that certain PKP officials are determined to frustrate and block any progress on a deal to secure and preserve the site. Despite meetings being arranged between key stakeholders, including the governor of the Slask province, the Conservator of Historic Buildings and Monuments for Slask province, the board of the society, and various arms of PKP, the latter has only paid lip service to any attempt to find a solution. Tactics such as – making last minute changes to the people attending, sending only junior members of staff who have arrived under prepared and without the necessary authority – have ensured that no deal acceptable to all sides has been reached. In contrast to this, the Conservator of Historic Buildings and Monuments is taking steps to have the whole site put on the register of historic buildings to give it greater protection. The shed itself is currently afforded the Polish equivalent of listed building status. At present, the ancillary buildings do not enjoy this protection; the process currently ‘in the works’ would see their status raised to the same level. The next round of the court case is scheduled for 21 April, and at this stage it is unclear whether it will reach a conclusion on this date. PKP are demanding back-dated commercial rental for the area occupied by the society calculated at the rate of 5000zl per month (approx. £1000). If the court decides in favour of PKP, the Society will be bankrupted and if an official receiver seizes the rolling stock many items in the historic collection could be cut up for scrap. Despite all of these distractions, the members of the society are still making progress with the restoration of rolling stock. Pride of the collection, Ty42-24, is nearing the end of an overhaul to mainline running order. 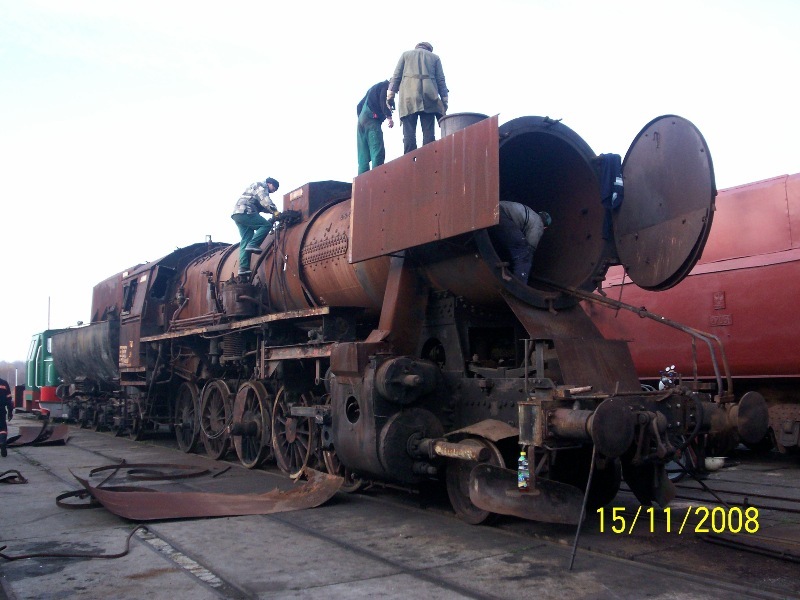 The start of Ty42-24’s overhaul in November 2008 at Pyskowice. Photo TOZKiOS. 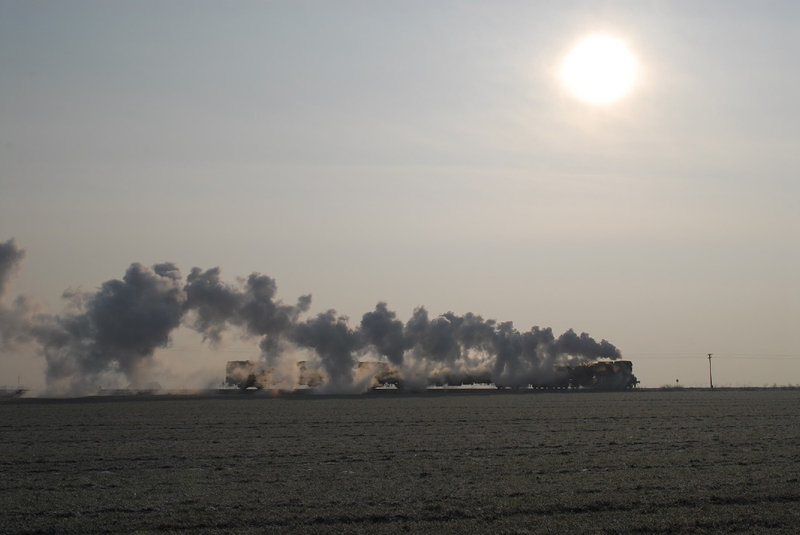 Meanwhile it would appear that the possibility that their locomotives could be legally impounded has prompted some of the overseas owners of locomotives to try to cut their losses. In particular news has reached us at BTWT that the future of TKt48-23 is looking decidedly insecure. Built by Cegielski in 1951, the 2-8-2 tank engine was withdrawn from service at Kluczbork in 1992, and is privately owned but currently resides at the Pyskowice skansen. The current owners (who are not Polish) are looking to sell the loco, and if no private buyer or consortium is found, will let the loco go for scrap to realise its cash value. The Pyskowice society realise how damaging this would be to their reputation. Readers may remember the damage that was done to the credibility of the society attempting to save the Piotrkowska Kolej Dojazdowa when they scrapped Ol49-48 to raise funds. The owners are asking in the region of EUR 17,500 for the loco, which they believe is a realistic scrap value. We feel that this may be over-optimistic given the current economic climate and the recent fall in the value of scrap steel, and believe the 78 tonne loco to be worth somewhat less than this. Despite the Polish economy still growing, we feel it unlikely that a local white knight will ride to the rescue and stump up the cash to buy the loco. Whilst we recognise the right of the owners to dispose of their assets, we feel it would be a scandal if yet another of Poland’s locos should succumb to the gas axe and the increasing pressure of market forces. Should any readers be interested in purchasing the loco outright, or forming a consortium to secure the future of the loco, please contact us at BTWT and we will put you in touch with the owners. 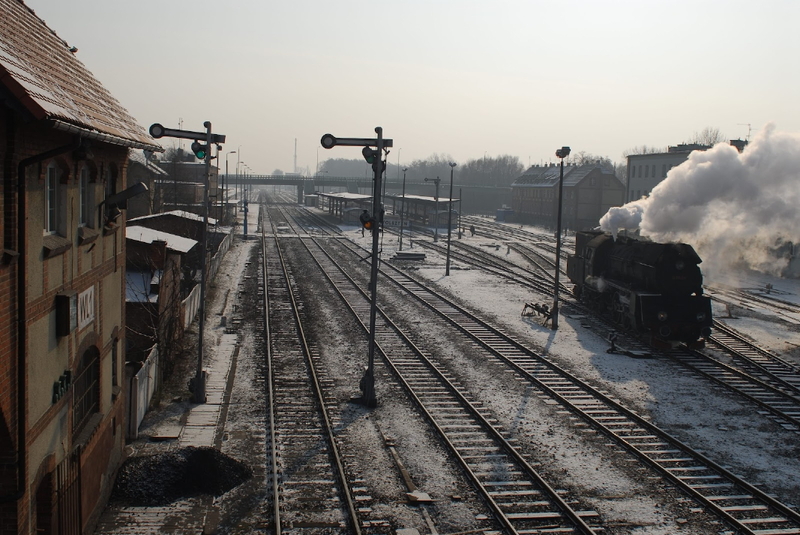 We set up BTWT in 2008 to support the faltering Polish railway heritage movement, it was the latest of a series of initiatives carried out by a group of friends with experience of railway preservation in Poland and in the UK. Since then we have won a few battles, lost a few, and reached stalemate in others. We do not campaign on our own account, but rather try to bring pressure to bear (through the pages of BTWT and through private channels) to support causes brought to our attention by Polish railway enthusiasts. This appeal is just such an occasion. Please help us help TOZKiOS win its battle with PKP by posting or faxing a suitable letter to Mariak Wasiak, the head of PKP, and also copying it to the Minister responsible for Poland’s railways. The top of page 1 of 7 pages of cuts. Przewozy Regionalne (PR) have announced large-scale service cuts in Silesia, despite a 30 million zloty increase in subsidy from the regional government. The cuts will be carried out in two stages: at the beginning of March and in June. All services from Bytom to Gliwice will go, and most services from Czestochowa to Fosowskie, Rybnik to Pszczyna, Rybnik to Chalupki and Zebrzydowice to Cieszyn. Alexandra Marzynska, spokesperson for the Chief Executive of Silesia, said negotiations with PR on reducing their operating costs had failed. Przewozy Regionalne is so expensive it’s hard to grasp. It’s a bottomless pit – it can absorb any amount and it will still be too small. It’s scary. Other regions have already discovered the same thing, hence the growth of smaller more efficient regional operators in recent years. Many local services in Pomorskie, Kujawko-Pomorskie, Wielkopolskie, Dornoslaskie and Mazowieckie regions are already being operated by such companies, including one route in Silesia itself: Czestochowa to Gliwice. It seems likely that at the end of PR’s current five year contract in Silesia, which expires in December 2012, PR will find themselves losing more local services in this region. Protests have followed the news, especially in Cieszyn, which will lose all of its train services in commuting hours. In this town which already has 15% unemployment, the protesters say that it will now be impossible to get to jobs in Bielsko-Biala, the largest city in the area. Compounding the problem for commuters is the two weeks notice given for such a sweeping change. Pleszew Railway – narrow gauge passenger and standard gauge freight – Winter 2010. Video by drezyna24. Further to our article Narrow gauge trains in the snow one of our readers wrote in to remind us that the mixed-gauge Pleszew Railway (750 mm and 1,435 mm) runs an all-the-year-round passenger service. The 4km long Pleszew Railway is the only operating section of the 750 mm gauge, Krotoszynska Kolej Dojazdowa. 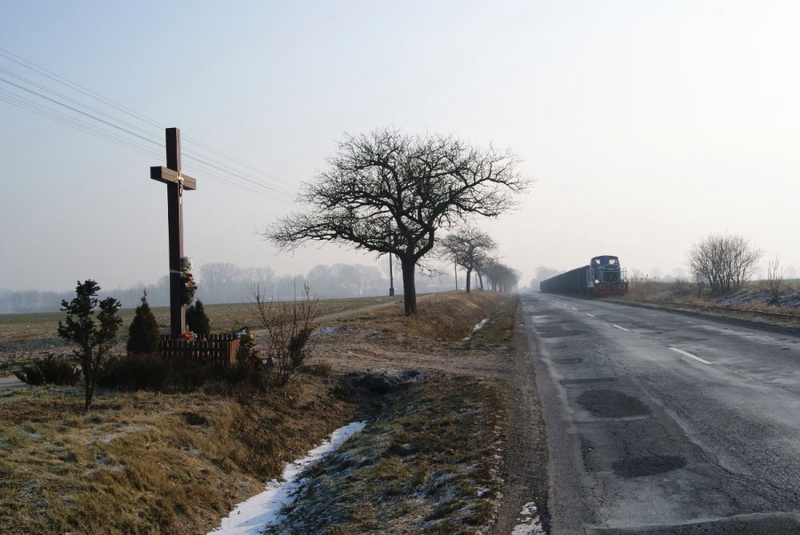 This 50 km line was built in 1900 and ran from Krotoszyn Waskotorowy to Broniszewice. It was radically cut back by PKP in 1986. The section between Pleszew Waskotorowy and Pleszew Miasto survived until 2001, when PKP closed all of its operating narrow gauge lines. The line was taken over by the Pleszew Urban District Council, which appointed SKPL as the line’s operator. Passenger and freight services were restarted in 2006 and with some interruptions have continued ever since. The very professional video, made by drezyna24, shows the line working during the winter of 2010. Finally, the last piece of the jigsaw falls into shape, but location No.12 actually raises more questions than it gives answers! ‘Slippy map’ courtesy Google Maps. Our final satellite view shows the crossing on the level of the standard gauge freight branch to the Lesmierz sugar refinery with the Ozorkow branch of the Krosniewice Narrow Gauge Railway. The Krosniewice system – the eastern portion of the erstwhile Kujawy Narrow Gauge Railways – has been featured many times on BTWT. Standard gauge trains travelling over the crossing were protected by two semaphore signals on the n.g. line and these were visible from the main road, so it is doubly surprising that no reader managed to identify this location. On the right edge of the picture, about a quarter of the way up from the bottom, a minor road forks off the route “1” main road and heads off towards Lesmierz; a narrow gauge branch also served the refinery, came off the line to Ozorkow, and ran alongside this road. So far so good, but now look at the layout here as shown on the Railmap – Kolejowa Mapa Polski website. Click on the link and when the map showing Sierpow and Sierpow Waskotorowy opens click the “RM Map” button – the last but one of the six buttons on the top right of the picture. The new map – a hybrid of the Google Maps and the Railmap mapping – shows the narrow gauge Lesmierz branch peeling off in a northbound direction and running over the route taken by the standard gauge branch, rather than peeling off in a southbound direction and running alongside the road. Is this just a mapping error, or does Railmap indicate an earlier route. What is more, the Railmap mapping (the map can be scrolled and zoomed just like Google Maps) shows the branch running much further than Lesmierz, and then splitting into three branches terminating at Janowice, Przewiska and Jackowice Waskotorowe. I had no idea that this system ever existed. Can any reader, more studied in the intricacies of the narrow gauge lines hereabouts cast any more light on the subject. But that is not the only mystery! Looking at the Google Maps map at the head of this article and clicking the link “larger view” shows a standard gauge branch line apparently terminating in the hamlet of Lubien, the rubrik kopalnia rudy zelaza (iron ore mine) helpfully identifies the purpose of the branch – or does it? Click the “satellite” view button. The standard gauge line terminates in a circular wooded area which could have been an opencast mine, now filled in with the rubbish of Lodz and planted over. There are some buildings to the East of the wood which look industrial. We will come back to this standard gauge line in a minute, but for the moment click “+” once to enlarge the picture and look at the centre of the bottom half. A narrow gauge formation peels of northwards, does a 90 degree turn and heads of to the South West. Scroll the map by clicking and dragging, and follow the line. It crosses the standard gauge Lodz Kaliska – Kutno line at right angles and shortly afterwards makes a sharp 45 degree turn clockwise and heads due West. Given the proximity of the Lesmierz refinery, there can be little doubt that this was once one of the many feeder lines that mostly saw traffic during the sugar beet season. Follow the formation as far as it goes. It appears to stop in the village of Skromnica, the last 300m now taken over by a farm track. Now a branch of the standard gauge branch comes into view. This line, substantially engineered with sweeping curves terminates in an airport. Google Maps shows no name or details. Using Wikipedia on the names of the nearest villages elicits no information. Though Poland left the Warsaw Pact some 22 years ago – this place, whatever it is, might as well not exist. Oh and I nearly forgot – the results! This time you needed more than the answer, you had to be the first to submit the correct answer to win the point. Undoubtedly those players who had subscribed to our e-mail ‘early warning system’ had an advantage! Dyspozytor set three questions which baffled everybody, so he gets three points. Inzynier also scored three points (and got several more questions correct). Waldemar Heise scored five points and is the overall winner! Two Lxd2 diesels ready to leave Smigiel Yard 16 February 2011. Photo 007. We have just heard that two Lxd2 diesels belonging to the Smigiel Railway have been loaded on low loaders at Smigiel Station. That the operation was carried out late at night does not bode well for their fate. Local supporters of the Smigiel Railway fear the worst – that Smigiel Town Council has sold the engines. We will publish updates on this story just as soon as more information is received. Ol49-59 having just come off its train at Wolsztyn, 6 February 2012. Photo ©Christian Cederberg. I am very fond of the Wolsztyn ‘kettles’ so it is a real treat to be able to reproduce these atmospheric photographs taken by Christian Cederberg, the webmaster of the Dampdreven blog. The Wolsztyn – Poznan steam workings are, to the best of my knowledge, (does any BTWT reader know of any other example?) the world’s last regular scheduled steam-hauled passenger (as opposed to tourist) mainline railway service. Christian visited Wolsztyn between 4 and 7 February and was kind enough to share these images with us on BTWT. If you would like to see the rest of his wonderful photographs please follow the links at the end of today’s post. Ol49-59 and train pass through Strykowo, 6 February 2012. Photo ©Christian Cederberg. Following our posting of John Savery’s recent photographs of Ol49-69 under repair in Leszno, a considerable discussion has taken place in the comments column of that post. The bottom line is that Leszno-overhauled locos are not as serviceable as those that had been shopped out of Gniezno, and that not enough money is trickling its way down from the sizeable grant paid by the provincial government to work performed on the locomotives themselves. Readers of the Aubrey-Maturin books by Patrick O’Brian will not need reminding that a similar fate befell the sizeable grants voted by Parliament each year to fund the maintenance of His Majesty’s Navy in the days of Nelson. Ol49-59 and train at Grodzisk Wielkopolski, 6 February 2012. Photo ©Christian Cederberg. Just pick up the snowplough and run it up and down the mainline. 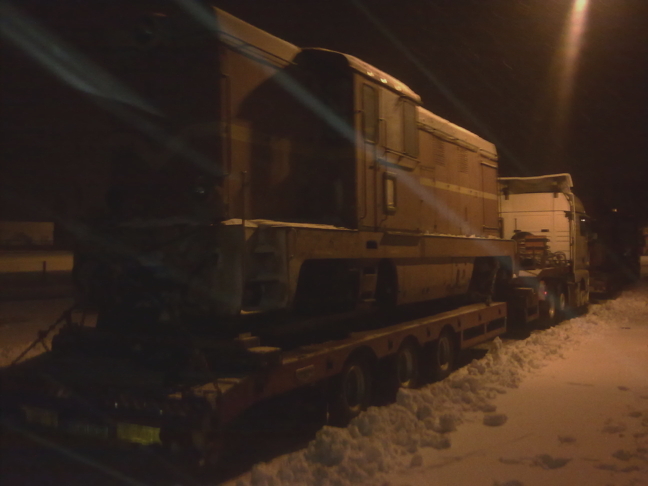 26 January 2012 – Getting the Bieszczady Forest Railway ready for the next day’s Winter Holiday train service. Video by RomekSolnicki. For the first time in many years, several Polish narrow gauge railways are running winter tourist trains for passengers to enjoy the snowy scenery, and they have proved a great success. In PKP days trains most lines ran trains all-year-round whatever the weather, but since PKP shed its remaining n.g. lines in 2001, the only trains during winter have usually been “Santa specials” operated by some lines in December. Despite the extremely cold and snowy winter this year all the trains have run more or less as planned, and old snowploughs have been brought back into use again doing a fine job of clearing the snow, especially in the Bieszczady mountains where there has been a large fall of snow this winter. Polish school children have a two week winter holiday, the Ferijie Zimowe. The exact dates vary from region to region but all fall within the period 16 January to 26 February. During this period the Bieszczady Forest Railway in south east Poland is running a tourist train each Friday and Saturday, amazingly using open sided coaches usually known as letniaki (summer coaches!). Winter Holiday train on the Bieszczady forest railway on 27 January. Video by RomekSolnicki. The video above shows one of these trains from Majdan to Dolzyca and looks well used, with the open sided coaches clearly popular with photographers and video-makers! The cameraman is having a problem keeping his camera steady when the train is running – a common problem on most of the Polish n.g. lines! Zulawy narrow gauge railway special, 28.01.2011. Photo bxi.pxd.pl. 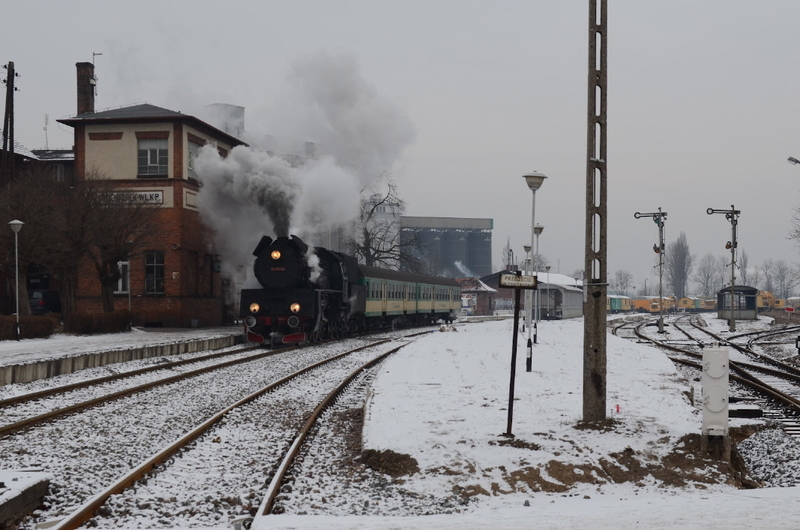 The Zulawy narrow gauge railway, which runs from Nowy Dwor Gdanski to the Baltic sea coast, ran a winter special on 28 January which reached Stegna and turned on the triangle there before returning to Nowy Dwor, on a superbly clear and icy winter day. The Rogow narrow gauge railway likes to do things the correct way. Here the guard fine tunes the heating system on a 1aw coach. Photo FPKW. The Rogow narrow gauge railway east of Lodz offered their first winter train on Sunday 5 February, using a Lyd1 locomotive, Polish 1Aw coach fitted with a traditional coal-fired stove for heating, and brake van. It ran from Rogow to Jezow where sausages were cooked for lunch over a bonfire. Such was the demand for the train that it was totally sold out and an additional train will run this Sunday, 12 February. 10:06 to Moreton-in-the-Marsh arriving at Slough Station on 7.2.2012. Part of the new footbridge with ‘gun port’ windows can be seen just below the old. Photo BTWT. Travelling by train in the UK has changed since I was a young man. I remember travelling from Towyn to Paddington by train just after the Euston electrification had been commissioned, the GWR route to Birmingham Snow Hill and Wolverhampton Low Level downgraded and the Cambrian Coast Express abolished. I had decided to try to stick to the ex GWR route as much as possible rather than using the newly electrified former LNWR route via Rugby. Between Birmingham and Banbury I found myself sharing a carriage with the late John Slater, editor of the Railway Magazine. After New Street our train negotiated a freight spur and rejoined the GWR lines. The DMU bumped its way cautiously over sagging rail joints. Though we were both returning to London after volunteering on the Talyllyn Railway not a word was spoken in true British ‘stiff upper lip’ tradition. But alas Britain’s post-privatisation railway muddle plays havoc with tradition. A journey from Slough to Carmarthen gave me an excellent opportunity to savour current practice on what was once one of the most prestigious GWR Routes. Slough is a town where the municipality has systematically destroyed every building of any architectural merit. Its councillors would feel perfectly at home with their colleagues in Lodz. Yet miraculously, the railway station, though each year crowded in by more soulless tower blocks, survives intact – a Victorian gem built by the GWR in honour of the monarch who gave her name to the age when British engineering and manufacturing was at its zenith. If ever a station deserves listing, and restoration to its former glory, it is Slough. Built for the use of Queen Victoria, its typical GWR brick-and-stone construction is topped by an extravagant roof covered with, even more extravagant cast iron lily-shaped tiles. So I was not very happy to see Network Rail erecting a brash new footbridge to replace the existing structure which had served well since 1884. 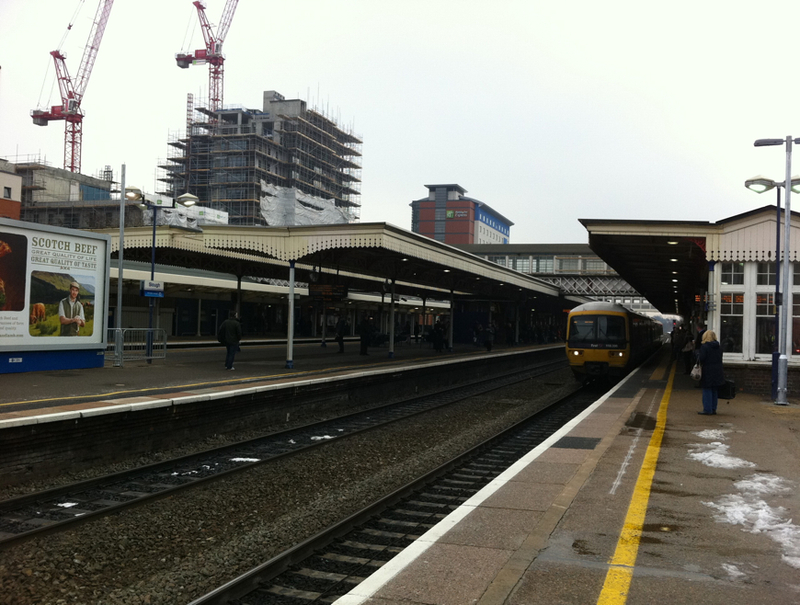 Temporary platform arrangements at Reading. Platforms 12,13,14 and 15 are still to be constructed. Photo BTWT. 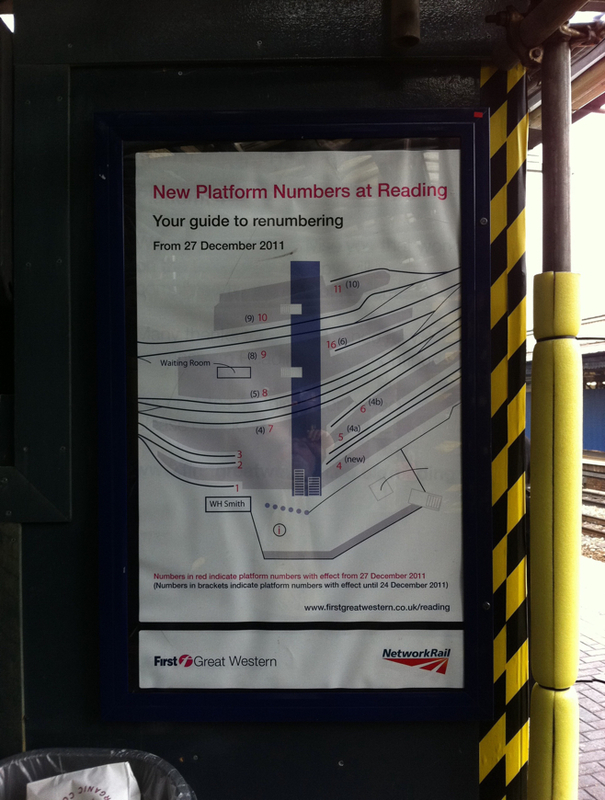 In contrast to the senseless desecration at Slough, the improvements taking place at Reading deserve full marks. On the south side of the station, the bottleneck that existed since the demolition of the LSWR station has at last been tackled. The single track ramp from the Wokingham line to the GWR station has been doubled and a new platform with two faces facilitates termination and servicing of Waterloo-bound third-rail electric trains. On the north side of the station the railway formation is being widened and five more platform faces will help handle mainline services particularly when Crossrail gets extended to Reading. The investment makes a great deal of sense and – unlike the strictly cosmetic improvements being carried out at Birmingham New Street – will massively increase the capacity of the station to handle train movements. I’m always depressed by Swindon. How could any government have allowed one of the greatest railway engineering workshops in the world to have been completely destroyed? At its peak the Works employed 30,000 people making everything from the harness for horses that shunted GWR trucks in remote country sidings to the steel plate from which the frames of the ‘Kings’ and ‘Castles’ were cut. Alas all that remains of its former glory are some rusty sidings and the Brunel-era buildings in its historic core taken over ironically enough by English Heritage. Building a snow wall to prevent drifting circa 1930 near Tarnopol. Officials from the Ministry of Communications and PKP pose for the camera. Photo NAC collection. A flurry of snow hits the UK the UK on Saturday evening and suddenly Poland is seen in an entirely different light! After last winter’s Heathrow chaos FGP TopCo Limited (operating in the Britain as BAA Ltd.) promised more snowploughs, more gritters, more everything. Yet after Saturday’s snowstorm, which lasted only a few hours, the worst delayed plane (due to depart shortly after 21:00hrs) actually got into the air around 05:30hrs on Sunday morning. On Sunday, Heathrow enjoyed temperatures well above freezing, there was no frost, yet BAA cancelled 50% of the flights due in and out of the airport. Inaugural run on the Kasprowy Wierch cable car railway in 1936. Photo NAC collection. 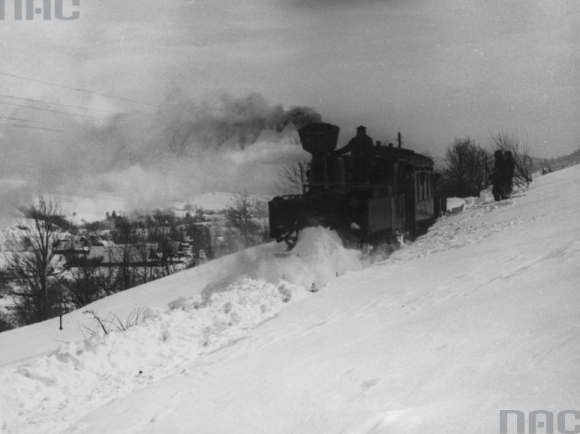 Snow ploughing on the Bieszczady Railway circa 1941. Photo NAC collection. Coping with snow is one thing that Poles have become rather good at as these photographs from Poland’s Narodowy Archiwum Cyfrowy (National Digital Archive testify.) 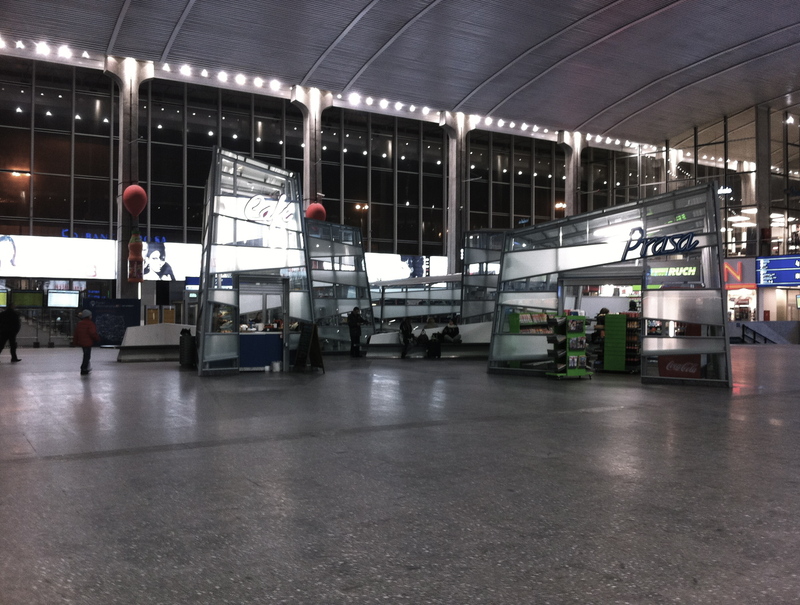 Last year’s chaos on Polish railways was one dreadful exception, but this year PKP has coped admirably. The Archive was set up by the Minister of Culture in 2008, and has digitised some 150,000 photographs and 20,000 sound recordings. A January walk along the River Soar in Leicester. Video by WeDOTHISprods. I am writing to register my protest at today’s post. I have refrained from writing before, although I have been very annoyed by ‘BTWT’. When are you going to publish the final sections of ‘A return journey’, announce the results of your last competition, or even deign to tell us what you saw and did in the Ukraine? Today’s post is the last straw! Where are the trains? What is the Polish connection? You seem to have been seduced by an arty-farty video produced with the aid of expensive video equipment which none of your readers cannot afford. You forget that most of your readers live in places like Leicester. They don’t want to see them again on ‘BTWT’. Please return to Polish RAIL subjects. Thank you very much for writing. You are right – we do take a long time to finish our serial posts. Are you volunteering to take the post of Deputy Editor? The short answer to your questions is that I am currently in the UK. I once rowed from Brentford to Leicester up the Grand Union Canal and this video seems to capture my feelings about the City and, in fact, the UK as a whole. The long answer (there are both rail and Polish connections) will be published on the ‘English Rail’ blog which will be relaunching shortly. PS. The video was made on a Panasonic GH2 camera (about £650) with a hack created by eccentric Russian Genius, Vitaliy Kiselev, incorporating patches (tested settings) by Nick Driftwood and Chris Brandin. the first train ran on an ex PKP railway line. SKPL train hauled by 401Da diesel returning empty wagons from Srem to Chempin on 4 February 2012. Photo SKPL. 10 years ago today, a PKP Cargo freight train hauled by a SM31 diesel locomotive brought 2 Hbbis wagons loaded with salt that had come from Hamburg-Süd to the freight transfer siding at Stare Bojanowo. Here the standard gauge wagons were loaded aboard 750mm gauge transporters and hauled by a Lxd2 diesel to Smigiel. So took place the first freight movement on a former PKP operated railway. A little train SKPL ran their first passenger train from Smigiel to Sniat. Alas neither freight trains nor community passenger trains run any longer on the Smigiel Railway, though the line survives as a ‘tourist railway‘. 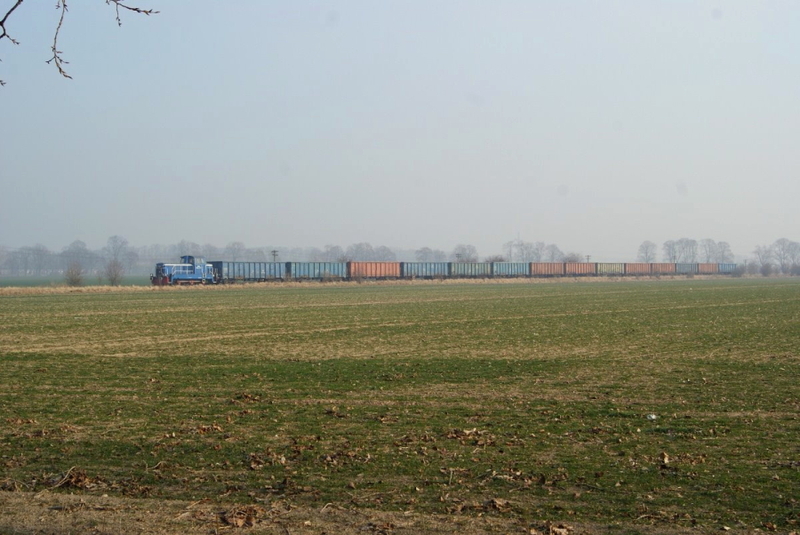 Meanwhile SKPL has become a major standard gauge ‘shortlines’ operator as these photos of 2 rakes of 14 bogie wagons being returned today from Srem to the PKP interchange at Czempin testify. Given the fate of the Smigiel Railway – a very apposite picture. Photo SKPL. Just look at the state of that road! How much worse it would be if the heavy freight to the foundry at Srem was going by lorry?